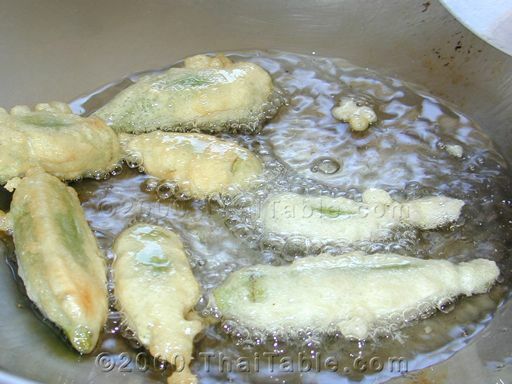 Fried okra is a great dish that is easy to make and friendly to those who like it less hot. 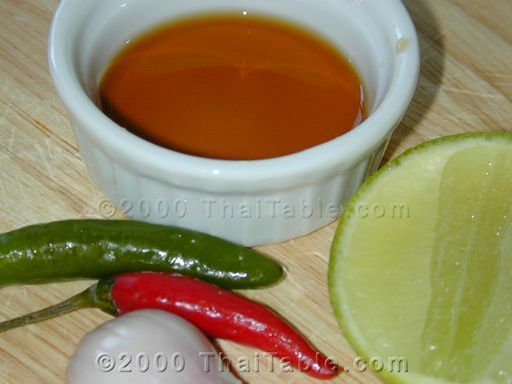 But, if you like it spicy, the fish sauce dipping sauce is the answer. I like dipping the okra in chili fish sauce, but my father likes it better with just soy sauce. With the soy sauce as a dipping sauce, Fried Okra can be a great option to make this dish vegan. In the summer when farmers markets are full of people and produce, I love getting the smallest okras. They're tender and easy to fry. They're even better crispy and crunch in your mouth. 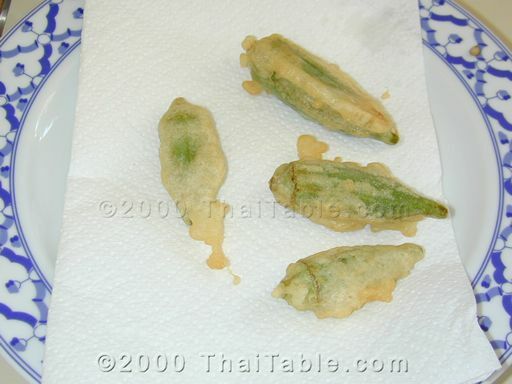 I love crispy fried okra and can't wait to munch on them. So I have a few while cooking them. 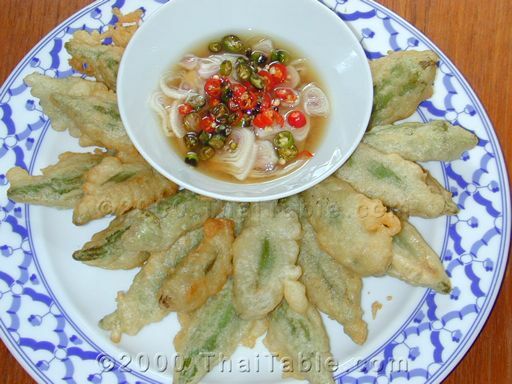 For a vegetarian version, dip the okra in soy sauce instead of chili fish sauce. It is best to cook this dish last if you are preparing other dishes to retain the crispiness. When it's time to reheat crispy fried okra (and other fried foods) a toaster oven or oven at low heat will return its crispiness, but a microwave will make it soggy. Mix all the flours, baking powder and water together. Stir and mix well. Drop the okra in. 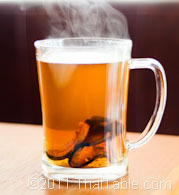 Heat up a cup of oil in a wok or frying pan over medium heat. Test the oil with a drop of batter; the batter should puff up right away. 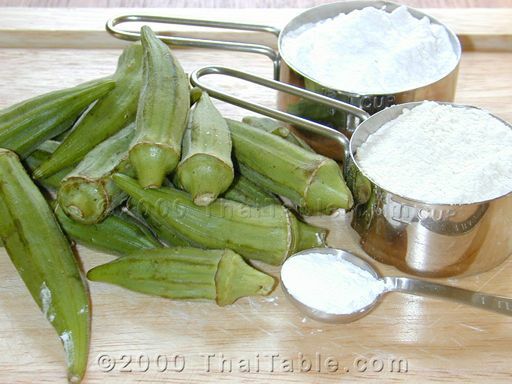 Coat each piece of okra with the batter and drop it in the pan. Fry until lightly brown. Remove and drain oil. Serve immediately. 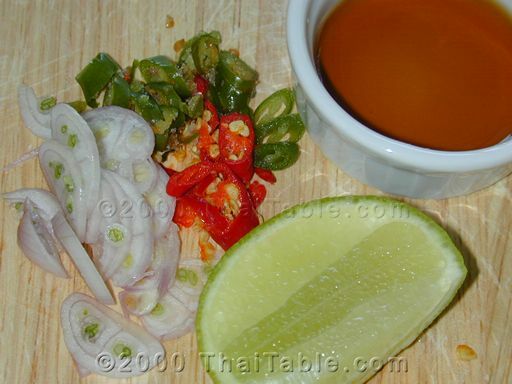 Serve hot with chili fish sauce (below) and rice.